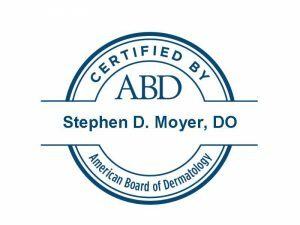 Stephen Moyer, DO has been board certified in dermatology for over 15 years. His interest in dermatology was kindled during a dermatology rotation in medical school. He earned his D.O. from Philadelphia College of Osteopathic Medicine in 1997 and completed a residency in dermatology in 2002 at the Medical University of South Carolina. 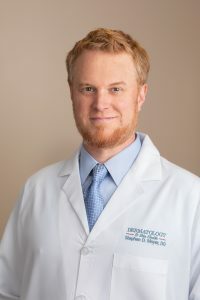 Following his residency, Dr. Moyer went on to practice dermatology at Hartford Dermatology Associates (from 2002-2008 – where he was bestowed with the “Top Docs” honor), Dartmouth Hitchcock Medical Center (from 2008 to 2013), and most recently at Elliot Dermatology prior to coming to Dermatology & Skin Health in 2017. 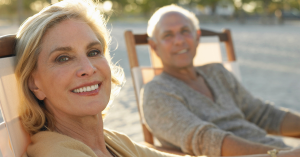 Dr. Moyer has an interest in adult and pediatric, as well as surgical dermatology. When away from the practice, Stephen enjoys digital photography, grilling/cooking, fly-fishing, kayaking, hiking, and woodworking.